Although it's not usually my genre, every once in a while i enjoy a good folky song. 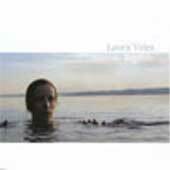 Filling that need in my life lately has been Laura Veirs. Ms. Veirs is a Seattle based singer and guitarist, and this is her first release for Bella Union Records. There are three songs here, and all demonstrate the strength of her voice and songwriting. The EP starts out with the title track, Riptide. This is a light affair with her singing and strumming away on the guitar, which is exactly what you would expect a folkie to do, and not bad at all. However, about halfway through the song, some strings swell up in the background to provide a lovely counterpoint to her guitarwork, and she stops singing and instead lets the music carry itself along. It's a rather pretty ending to this song. The next tune is Raven Marching Band, which starts with a staccato guitar riff. The riff carries along under her voice, until eventually it is joined by a viola, which plucks away at a happy little melody. Overall, this is the weakest of the three songs here, but it's not bad at all. It is also the simplest of the three songs, and that might be part of my issue with it. Finally, Ms. Veirs wraps things up with Cliff Driver, which is a darned fine song. She is playing an electric guitar here, plucking away at the strings lightly as the song is carried mostly by her voice. Something about her playing here reminds me of Billy Bragg's early work. After about a minute of this Braggishness, she is joined by an organ, light jazzy drumming, and another voice singing backup (but which might just be her voice in layers). The full band sound really works here, and this song is a happy little thing to which i just want to bop my head. Then she ends it wonderfully with some horns, playing a light trill of notes to layers of voice. The whole thing gets somewhat loud, slightly messy, and very enjoyable. Overall, this is a good EP. It's not all straight up folk music, in that Ms. Veirs often uses more instrumentation than just her voice and her guitar. She has a lovely voice, and it's not one of those fey girl singer/songwriter voices. Nor is it a deep female voice. It's a normal female voice, not too high or too low, but it's confident, and she has good pronunciation, which makes the whole thing work for me. At any rate, i am rather impressed with Mr. Veirs, and look forward to hearing more from her.